my mom & sister always get tickled when they come visit me because I don’t have a single clock in my entire house. 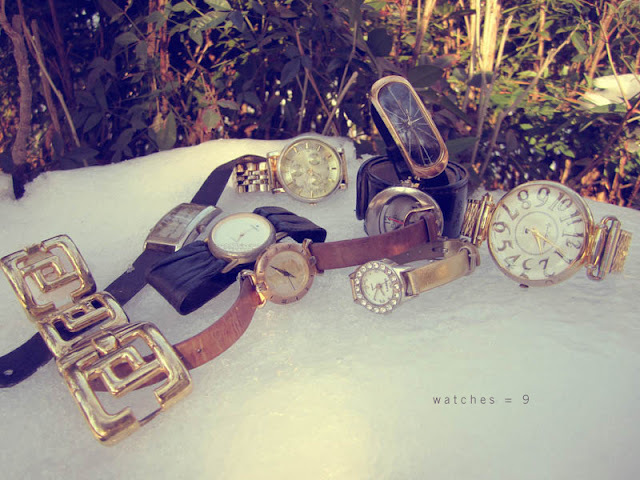 kind of ironic, seeing that I own a collection of watches, 95% of which do not even tell accurate time. I remember seeing an interview on tv with a model at her flat in new york, and noticing her numerous watches and bangles dangling from her wrist. not too sure why that got me excited, but since then I started picking up cool watches at estate sales, spending no more than $3 - $4, since they usually needed a new battery or just simply had no more to give. as annoying as it can be to my friends and co-workers, I refuse to wear just one watch—I like to mix it up, adding a large-faced gold menswear watch with a my thin leather-banded coin head watch, paired with my 80’s chunky gold & black watch. the combinations are endless and it excites me every morning to choose the perfect wrist accessory for the day. What an amazing collection! Kara, you have some divine stuff, and I love how you take time to curate it!